« Is the Meaningful Use program making the expected progress? 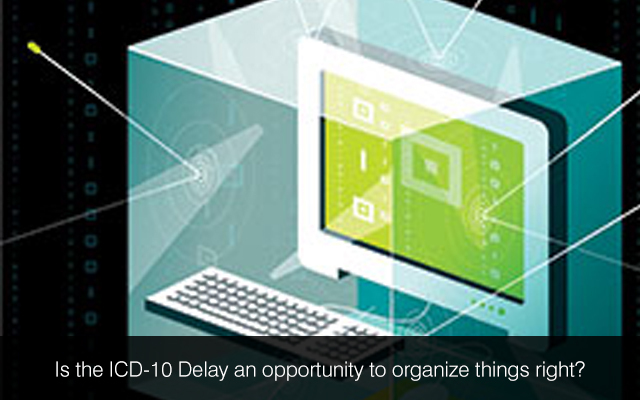 Is the ICD-10 Delay an opportunity to organize things right? It is merely a simple statement posted in the CMS (Centers for Medicare and Medicaid Services) website. Then again, it creates an impression that CMS has disclosed the fact regarding ICD-10 implementation postpone to October 1, 2015. However, the website still carries the transition to ICD-10 on October 1, 2014 as due date. The U.S. Senate passed a bill which extends the ICD-10 due date to at least October 1, 2015. The bill, the Protecting Access to Medicare Act of 2014, mostly handles the delay of any reimbursement cuts to doctors under Medicare’s sustainable rate of growth formula. The bill guards doctors from the 24% reimbursement cut was scheduled to take effect from April 1, 2014 until about the end of March 2015, and it is the 17th short-term legislative solution for preventing SGR cuts Congress has passed since 2003. What really is keeping CMS away from a conclusive declaration date regarding the new ICD-10 due date is the procedure for providing a compliance date. Because the implementation due date is dependent on congressional language approved by the House and Senate and marked into law by President Obama on April 1, CMS should start think of its alternatives on the method as how to make up the legislative procedure along with its own regulating procedure. Despite the fact that this is the second time in almost two years that the ICD-10 consistence date has been pushed back, this time its activity by Congress not CMS that has been taken. The delay will probably be disruptive and excessive for the healthcare delivery innovation, payment reform, public health, and healthcare investing, and doubt regarding the implementation date just raise the interruption and cost, as stated in 11 April letter to CMS administrator Marilyn Tavenner, the Coalition for the ICD-10 urged that the delay for the code switch over due date not stretch past Oct 2015, and therefore CMS declare October 1, 2015 as the latest implementation date for the ICD-10 as quickly as possible. Kathleen LePar, VP of key administrations at strategic services at Beacon Partners, stated in a latest blog: “We have been hearing for the previous two years, ‘I had enough time to implement ICD-10 effectively.’ “Well, now you have the chance to do it right.” LePar mentioned some beneficial examples for the stakeholders should take advantage of ICD-10 compliance due date is delayed until 2015 by Congress. Now the issue is how can healthcare organizations justify the budget to carry out the following initiatives on an extended period of time? If one makes few sound functional modifications, increase your revenue cycle procedures, recognize and minimize risk, you will definitely enjoy the economic and compliance benefits eventually. You are likely to recognize better billing performance and output by recording all services supplied properly for compensation. Industry reports project about 30% to 40% drop in cash after the transition. For those who spend the money and time, now to consider many of these measures, you would be better placed minimize the possibility of the substantial effect on cash flow. Since Clinical Documentation Improvement (CDI) continues to be a critical component to quality reporting and enhancing cash flow, it has an important effect on making the most of your reimbursements both before and after the transition, regardless if it’s Oct 2014 or Oct 2015. Irrespective of the delay decision, you need a way to maintain and encourage coders. When you have spent money training them, you must have an excellent plan to ensure that they’re at huge demand. Losing coders might be a acute problem despite having a delay. The delay has an advantage to execute a “deep dive” which will discover and enhance current work flows to improve performance and productivity to push bottom line enhancement along with constant risk analysis. You may take an advantage of the delay to judge the way a CAC option can really help reach transition goals while reducing expenses and growing coder productivity. Implementing CAC correctly needs time to work and practice to achieve the most productivity results. A Clinical Documentation Improvement (CDI) Program will help you to improve the benefits of CAC. The delay gives an opportunity to determine the possible risk areas and issues within ICD-9 and ICD-10 codes. You can find the areas for extra training after the final results of dual coding. Earlier it was challenging for a lot of organizations to operate within the pressurized time schedule. Since it is delayed now, the additional time can be used to get a more complete plan to make sure each IT systems as well as partners have the capability for receiving and producing ICD-10 codes for billing and internal/external reporting reasons. Healthcare software development teams can help you build projects within allocated budgets and time schedules. We provide healthcare IT services. All of our healthcare developers have cleared industry certifications. If you would like to hire healthcare software developers from us, we would be glad to assist you at Mindfire Solutions. This Post was posted in Health Care and tagged develop computerized physician order systems, Develop Electronic Medical Records, develop medical e-learning solutions, Develop medical practice management software, develop physician cpoe systems, emr software developers, healthcare it services, healthcare software development, hire healthcare software developers, web based EMR/EHR development. Bookmark the permalink. Why is US Healthcare Spending Always Increasing? Should You go for Development of Your Mobile Website Using HTML5? Is Telemedicine on Track to Fulfill Its Potential?